lol, scientists quoted but not named. But the organization was…. NAS. I’d sure like to know who his sources were and where that <1 degree came from. Google ought to start charging for that service, they could double their profits overnight. 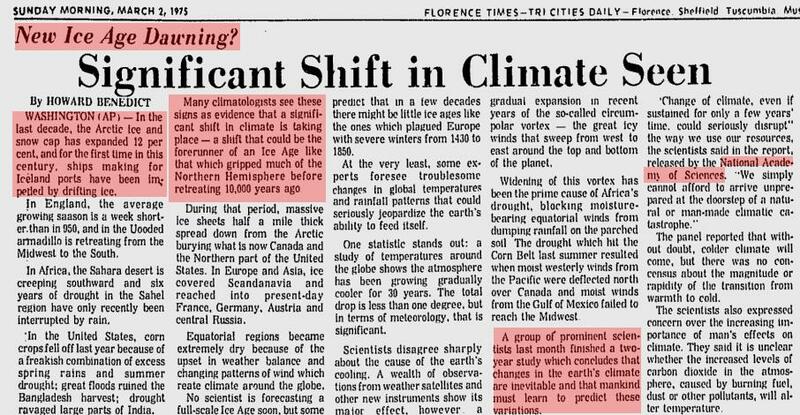 Check out this one, Ice free by 10 years, but then article says 20-30 years, I guess they have all bases covered? In 1975 they got the Idea of releasing massive amounts of C02 into the atmosphere to warm up the planet, they quickly realized (in the face of impending doom) that this would be an impossible task with both; the colossal engineering involved and in terms of the cost. Why did they not release massive amounts of C02 into the atmosphere to prevent global cooling? (which at the time there was a consensus that it was caused naturally). Why in 2011 (after years of man made global warming lies) when global temperatures are equal to or lower than those in the 70’s, are they Not promoting the Idea of releasing massive amounts of C02 into the atmosphere to warm up the planet? If you swap “climate change/disruption” with “asteroid strike” or any other major potential disaster, you’ll get the same impression, only we are not paying an asteroid tax yet! knowing that the science is in these guys hands, you can expect future disasters to be explained away after the event in monetary and political terms, and no one will be held accountable for the complete incompetence wither or not there was a tax in place. Apologies if seen/posted/commented before, but Andrew Bolt gave a top notch performance. The Ice Capades team: Serreze, Julienne and Walt Meier, plus all their sycophantic enablers should be able to see their obvious flaw and now admit that they are cherry pickers of the first order. Why? I’m glad you asked. It’s because they tout the Satellite Record as an appeal to authority knowing full well that it starts at a very cold period. This is as deliberately misleading as taking an ultra-modern thermometer and measuring air temperature from 4:00am until 4:00pm. Exactly what result is to be expected? (Hint: not the same result seen from 4:00pm until 4:00am). We should never forget that exactly the same ‘trick’ also underpins the bulk of the thermometer record. That is, the most often cited data conveniently starts near the end of the Little Ice Age. Exactly what result is to be expected? (Hint: not the same result that would seen with thermometers starting circa 1000 AD). Hmmm, Satellite record circa 1980 following a dramatic cold period, Thermometers circa 1890 following a dramatic colder period. They couldn’t have planned this scam better if they had tried (or did they?). How is it even possible for a real scientist loyal to the discipline to engage in such practices without either malice or complete incompetence? And they wonder why the people are furious?